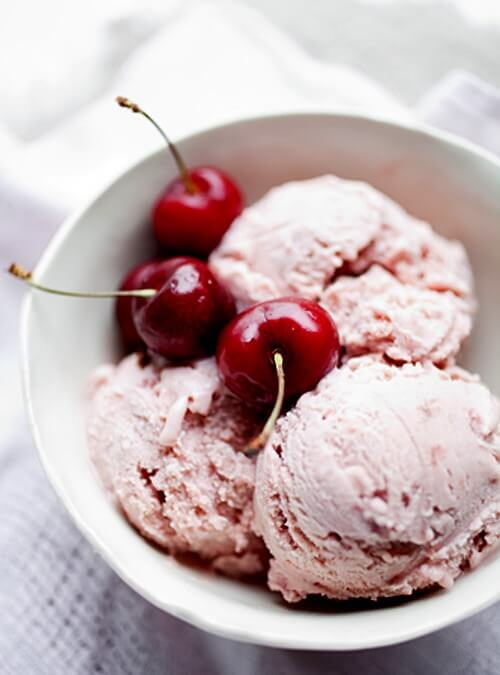 This old time cherry ice cream recipe won't disappoint. You'll be able to make great-tasting frozen treat that the whole family will enjoy. Whenever cherries are called for in cakes, cookies, pies, or frozen ice cream, they add their unique flavor and color. And this easy-to-make ice cream bursting with the delicious flavor of cherries is no exception. Two pounds of cherries, one quart of cream, and twelve ounces of sugar or syrup; pound the cherries, with the stones, in a mortar, adding a few ripe gooseberries or currants if approved of; pass the pulp through a sieve, add the cream and sugar with the juice of two lemons and a little cochineal (red food coloring), mix, and freeze. Instead of the liqueurs called for, the juice from a jar of maraschino cherries can be used instead. Also, maraschino cherries (halved or chopped fine) make a tasty addition to the ice cream mixture. With preserved fruit it is made the same way, adding a little noyau (a French liqueur), or a few bitter almonds pounded for the flavour of the kernel. Take a quart of cream, put it into the ice pot (ice cream freezer) with six ounces of sugar, which you place in the ice; work or whisk it well about the sides with a whisk for five minutes to chill; add a glassful of Maraschino de Zara liqueur, work this well together; then whisk the whites of two eggs to a strong froth, add two ounces of sugar to them, mix this well with the cream mixture, and freeze to the required consistence. This produces a very beautiful, soft, and mellow ice cream.